Looking for an original gift? Surprise a birthday party, a party-goer or a jubilaris with a gift voucher for Sleepers and Sailing ships! Allow the recipient to search for and book an overnight stay or sailing trip. The selection consists of several possibilities: a visit to Oerol on Terschelling, a weekend in Amsterdam or beaching on the Wad, a B & B in the lively city of Groningen or a sailing trip on the Wadden or child-to-parent wandering, anything is possible. The gift voucher is also very suitable as a nice addition to your Christmas package for the entire staff. Would you like a receipt with a different amount than that stated on this page, please contact us. We are happy to arrange this for you. How do I order the gift voucher? or click the are redirected under the appropriate voucher. We will send you a mail with a unique voucher with a personal code. Once we receive the voucher is activated payment. If you want us to send the voucher directly to the recipient, this is also possible. How can I redeem the gift voucher? 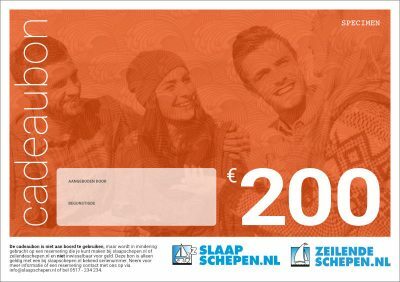 Contact Slaapschepen.nl *** and enter your code. Let the world know what night, arrangement or sailing trip you wish to redeem the voucher. Bit on the late side with order? Click on the link "Download sample" under the appropriate voucher. Print the sample voucher, fill in the recipient's name, and give it to the lucky one. 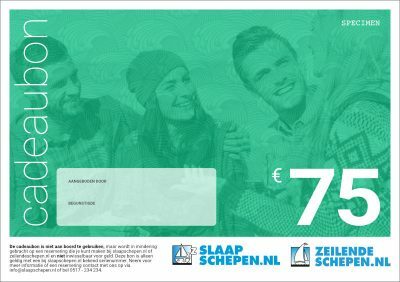 Contact Sleepers and receive the valid voucher by mail with valid serial number and send it to the recipient after receipt. * The voucher can be used once and can be exchanged for an overnight stay, package, sailing trip or sailing trip. ** If the value of the voucher exceeds the value of the reservation, no refund will be made. *** The voucher is NOT in exchange aboard the ship prior to a night or sailing trip. 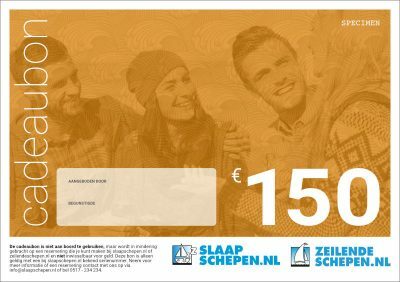 Valid only when making the reservation via Slaapschepen.nl or ZeilendeSchepen.nl. For more information, please contact 0517 - 234 234 or info@slaapschepen.nl.